The Compulsive Reader: Meeting Irene Latham! Sunday afternoon I traveled to the Flint Institute of Art in Flint, MI to hear Irene Latham, author of Leaving Gee's Bend, speak. 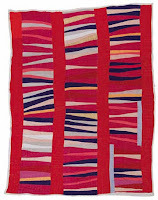 The Art Institute has an exhibit right now called Mary Lee Bendolph, Gee's Bend Quilts, and Beyond which features unique and beautiful quilts made by the women of Gee's Bend, a small, isolated town in Alabama that has a strong tradition in quilting. These aren't exactly the symmetrical, perfectly patterned quilts your grandmother makes. They are made from whatever fabric the women could spare, and they didn't waste a single thread. The pieces are unusual, abstract, and striking. The museum brought Irene in to talk about her book since it takes place in Gee's Bend and quilting is an essential aspect to the novel (along with courage, independence, and most importantly, love). She spoke to the audience about her inspiration for her many stories and poems about Gee's Bend when she saw the exhibit for the first time, and showed us her beautiful book trailer (which I've included below). She also answered a bunch of questions, and read a few excerpts from her book. Then when we headed out of the theater to get our books signed, we saw a large group of the quilters from Gee's Bend leading a large group from the exhibit across the lobby, singing the most beautiful songs. They were powerful! And of course, the fun part--getting my book signed! Irene was incredibly sweet! I petitioned her for a novel in verse (her poetry is beautiful! ), so hopefully one day. She also told us she was looking forward to writing more stories set in Gee's Bend--I can't wait! I shall have my review of Leaving Gee's Bend up soon! It was an excellent book! You are so lucky you got to meet her! I adore Irene!! And what a cute picture of the two of you. :-) Yay for MI signings! You have an award. :D Come and get it on my blog.